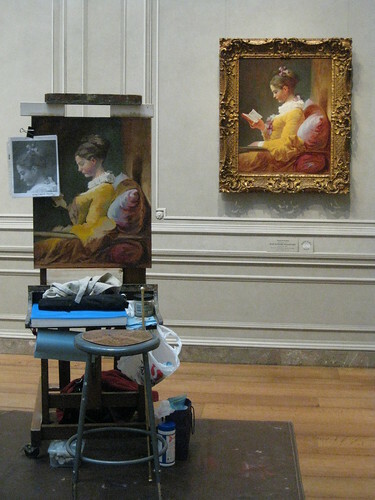 Last week I was at the NGA to work on the copy of Fragonard's Young Girl Reading on Thursday. For the first part of the day I worked on correcting the structural issues of the painting, working to get the scale of the girl correct. I worked until lunch time on just focusing on this aspect. The day was a particularly gray and dark day which affects the quality of light of the museum's galleries, something I did not really notice in the morning because I was so intent on correcting the drawing aspect of the painting. It was only when I came back from lunch did the difference really seem aparent to me. Each painting in the gallery has a spotlight that has a warm tint to it, where the easels are solely reliant on the natural light that filters into the galleries via the skylights above. This difference in light quality was affecting my ability to get color and value accuracy because the light on the painting was so different than the light on my canvas. Here is a photo taken just after lunch with my painting on the easel and the original on the wall. 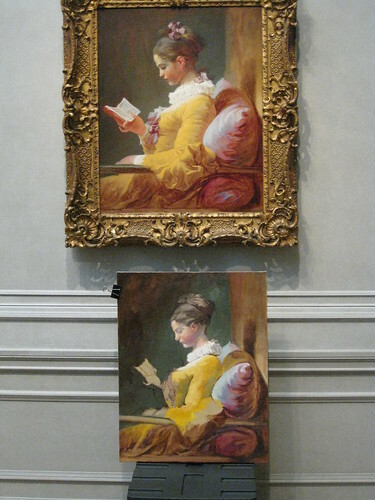 Here is another photo where I set my painting under the original painting to compare color and value differences. 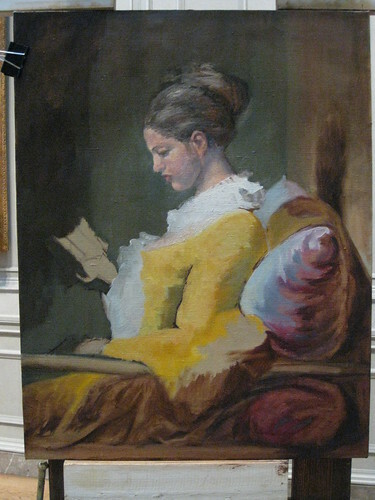 See the light ground behind the pillow, how different it is on the easel versus when propped up under the original painting, while working on this painting I also need to work on adjusting for this shift in color temperature also. So my time spent after lunch was a combination of getting the drawing correct while also adjusting the color and values some. Tomorrow I return to the NGA, Monday is my regular day to paint, so hopefully it will be a bright and sunny day to warm up the natural light some. I need to work on the structure of the head some more and will hopefully be able to move on to other parts of the painting as well.